Could anyone explain what happens to the monsoon trough now? Does a cyclone break it down/dissipate it. It appears to have dragged it south. But does it preclude more TS formation for a certain period? It's interesting that CMC out performed EC on Nora from midweek. 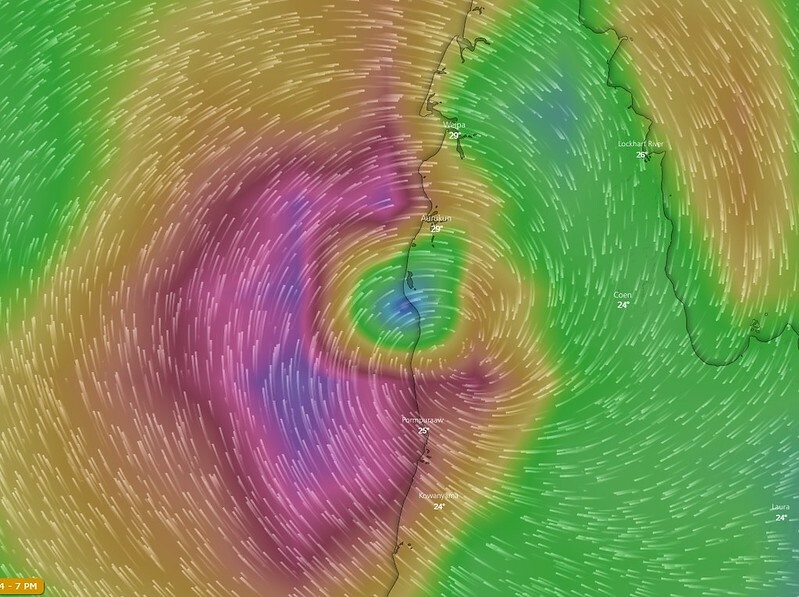 EC had a deep system remaining over water and heading towards Mornington Island when CMC was already pushing it onto the Western Cape from Wednesday. As late as Friday EC still had it remaining over water. EC has already initialised the system wrong this afternoon. Unbelievable how terrible its been. The low will probably go over to western Australia and reform to a cat 5. 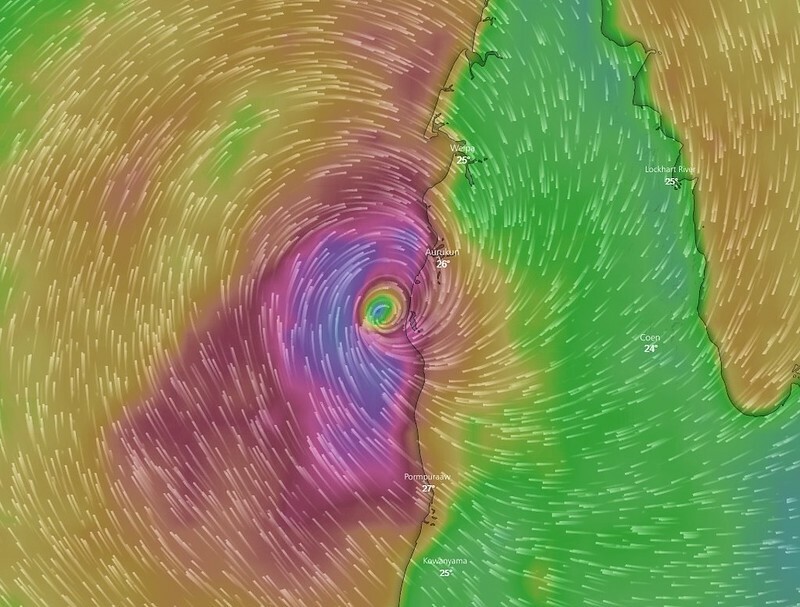 Mabye Popeye has invented a cyclone magnet. Nora has now weakened below tropical cyclone intensity. NT/Qld Border to Burketown, including Mornington Island and Sweers Island. Warning cancelled for Kowanyama to Karumba, and adjacent inland areas. Watch cancelled for Karumba to Burketown. Intensity: Tropical Low, sustained winds near the centre of 55 kilometres per hour with wind gusts to 95 kilometres per hour. Location: within 55 kilometres of 16.6 degrees South 141.3 degrees East, estimated to be 115 kilometres north northeast of Karumba and 230 kilometres east of Mornington Island. Movement: south at 9 kilometres per hour. 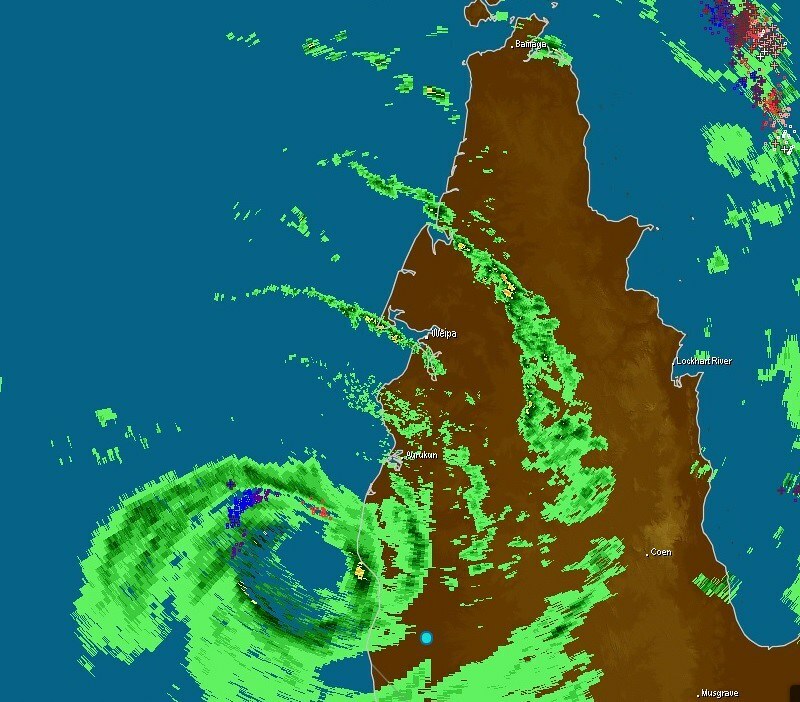 Ex-tropical cyclone Nora is slowly moving down the west coast of Cape York, near Gilbert River Mouth. 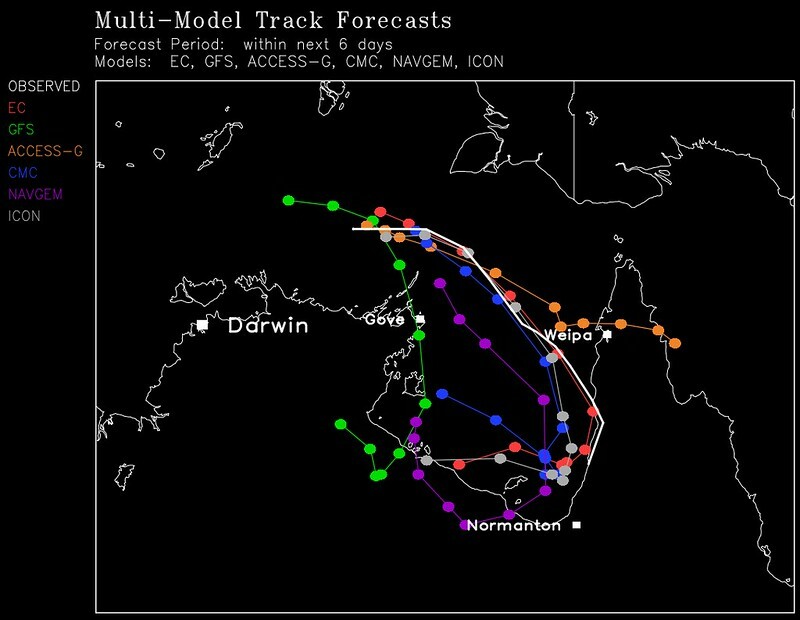 On the current forecast track, ex-tropical cyclone Nora is expected to move back over southeast Gulf of Carpentaria waters during Monday and if this were to occur it is possible that it could reform back into a tropical cyclone by Tuesday. However, given the forecast track of Nora is quite close to the coast, the possibility of it moving back over water sooner cannot be ruled out. 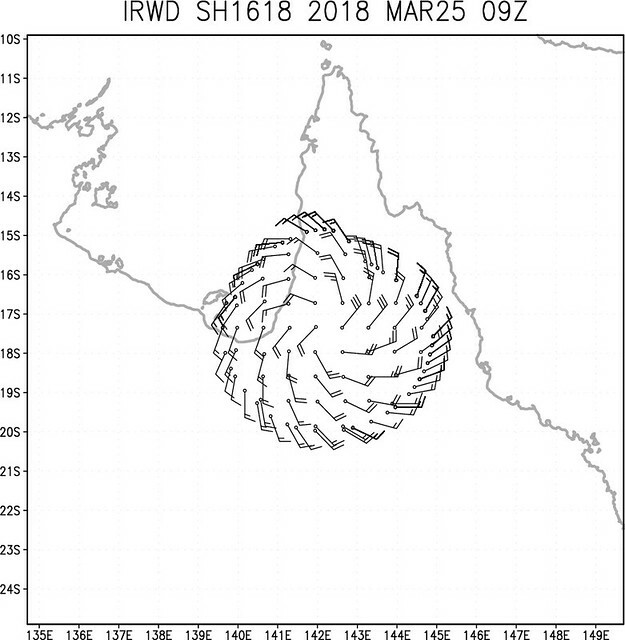 GALES may develop between Burketown and the NT/Qld border, including Mornington Island and Sweers Island, on Tuesday, though this will be highly dependent on ex-tropical cyclone Nora moving back over water and reforming into a tropical cyclone. HEAVY RAINFALL is forecast over parts of the Gulf Country district today and Monday, which may lead to flash flooding. A Severe Weather Warning for heavy rainfall has been issued for parts of the Gulf Country and a Flood Watch is current for Gulf Rivers and Cape York Peninsula. 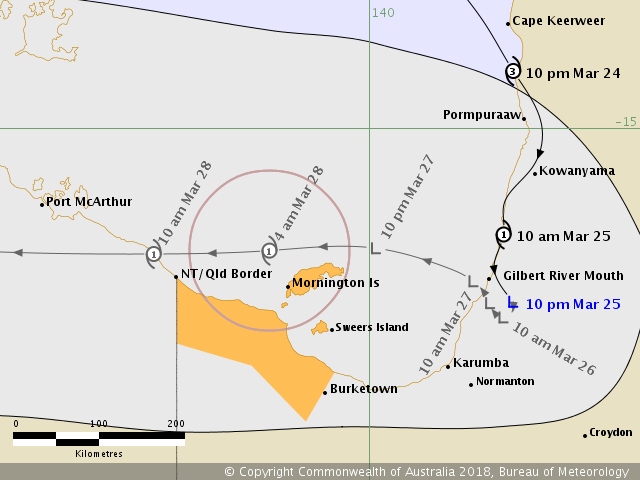 People between Burketown and the NT/Qld border, including Mornington Island and Sweers Island, should consider what action they will need to take if the cyclone threat increases. - For emergency assistance call the Queensland State Emergency Service (SES) on 132 500 (for assistance with storm damage, rising flood water, fallen trees on buildings or roof damage). It's not the first time it's been so far out Trav. You may recall it tried to send Oswald across the Cape towards Darwin. Nora's looking like she's doing the Walk of Shame after a messy Hen's night out at the moment, can barely pick any circulation on Radar. Looks better on satellite though. Still a short term forecast rather than the initialised position though. I've updated the past multimodel forecast tracks (coloured) vs observed track (white) up to 10am today. Don't really know what the go is, but it would seem that BOM is well off the Mark, along with nearly all the Models when it comes to the actual location and track of Nora even now. Seems to have gone way further inland than depicted by BOM, and still further Inland and South now than indicated on the official Track Map as well. Just My opinion, but unless the satellite is out of whack, the pictures sort of talk for themselves. Normal for a cyclone being sheered by upper trough to have upper circulation displaced towards SE of surface level circulation. Infrared picks up the upper level clouds. Visible shows the lower level clouds better, so wait until visible satellite is available. Even then I think low level circulations will show up clearly over ocean, but not so clearly over land. A lot of things aren't what they seem at first when it comes to TC's and this is one of them. 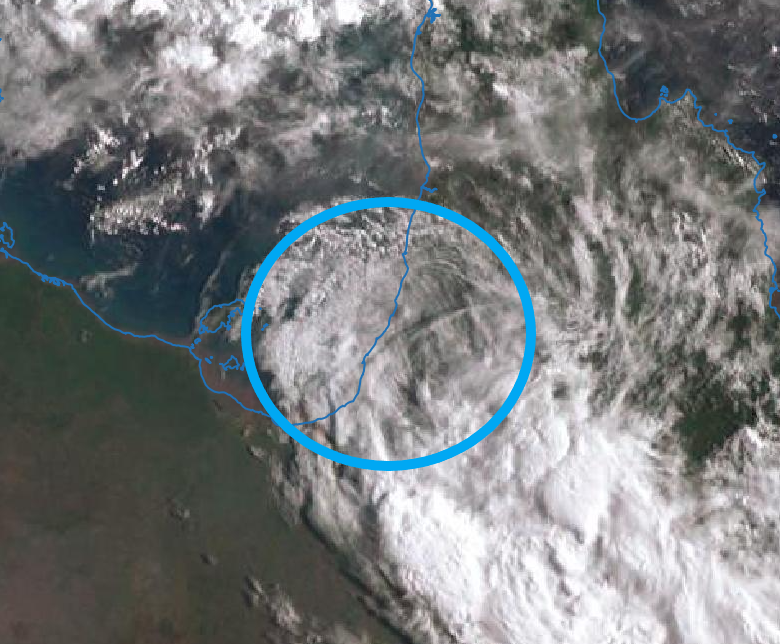 The area of strongest convection on satellite images often doesn't coincide with where the centre of the system actually is when it comes to decaying systems (the centre is often displaced well away from the area of max convection depending on shear and other dynamics). In ex-Nora's case, the system is tilting south with height which also seems consistent with the fact that satellite sensors and associated algorithms designed to estimate the position of weak systems suggest ex-Nora's centre is north of where the max convection appears on the satellite imagery (near the time of the Bureau's track map that I'm assuming you were referring to). Having said that though, given how unclear Nora's structure is on radar and satellite imagery to the naked eye now, obtaining a precise fix on its centre is virtually impossible. Some narrative and images on Nora from Nasa's precipitation mission.